Thirteen students at Bujumbura Christian University (BCU) have recently graduated after three years of intensive studies. This was a joyful occasion marking an important step forward for the Anglican Church of Burundi in the area of education and training for future leaders. On behalf of the Church Archbishop Martin Blaise Nyaboho expressed gratitude towards all those whose support had made possible the implementation of the University. He urged the first graduates to become models for future generations who will be trained there. Rev. Canon Donald Werner, the Vice Chancellor Emeritus said that 12th February 2019 will always be a historical day in the history of the Church.Rev Donald saluted the courage of students who persevered with their studies especially during the crisis of 2015. 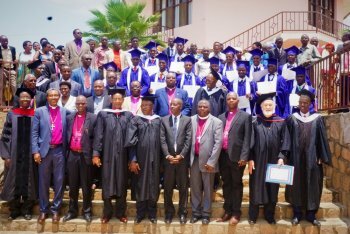 The graduates, 12 men and 1 woman received their Bachelor in Theology degrees in the presence of all the Bishops of the Anglican Church of Burundi, representatives from the Ministry of Education and other dignitaries, guests and family members. “We are happy and feel blessed to stand on this land where the Gospel that has changed our life has started”. That was the common statement of delegates from Kenya, Uganda and Tanzania who attended the East African Revival Fellowship held in Bujumbura from 15th-17th February. Around 40 delegates, among them Bishops, priests and government employees in their respective countries gave their personal experience on how they witnessed the goodness of Christ. Referring to the letter to Hebrews they recommended people to hold on to Christian values particularly love and consideration for others. There was excitement and joy as testimonies were shared and people gave their lives to Christ. The Rt. Rev. Eraste Bigirimana, Bishop of Bujumbura Diocese thanked the delegations for their presence and commitment to the Revival Fellowship that reminds the present generation of the faithfulness of past believers who stood firmly for their faith without compromise. The Anglican Church of Burundi is concluding the annual tree campaign started in December last year. 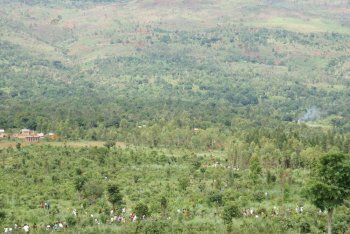 With collaboration from the different dioceses, local administration and community members around 800,000 trees have been planted on public and private lands. Every year the Anglican Church sets up nurseries of trees. A woman in Rutana said that she has participated in the campaign because trees are the main source of energy for her. Community members expressed their gratitude for the trees that will help them to protect the environment and their lands especially against soil erosion. The area around Matana is rural and so most people live by subsistence farming. Life is precarious and poverty levels are high. Income generation is essential for survival. The market is a hub for the community as well as being a place where business is carried out. People buy their daily supplies of food, clothes and shoes, school uniforms, exercise books and other school materials, baskets, furniture and many other essential items. It is where parts for cars can be found and bicycles repaired. At the beginning of this year fire completely destroyed the main market of that area with disastrous consequences for the community around. Families and individuals, including many pastors and Church teachers lost their main means of income. More than 350 people not only lost the goods they sold but also money they kept saved there. Matana was one of the first Anglican mission stations founded in the 1930s and the Church is an integral part of the community. Very quickly the Diocese of Matana led by its Bishop, the Rt. Rev. Seth Ndayirukiye looked for ways to respond to the disaster. 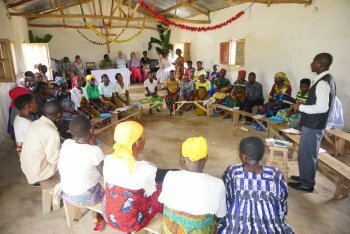 They began to support those most affected by giving small sums of money so that they could restore some form of business in order to generate income once again or sort out loans they had with banks or through micro finance. One of the outcomes of the Literacy and Financial Education Programme supported by Five Talents is that a number of people were able to initiate income generating activities in that market. To see all they had built up over a couple of years destroyed in one day has been devastating. A team from Five Talents that has very recently visited the dioceses of Gitega, Makamba and Matana to see the Literacy and Financial Education Programme had an opportunity while in Matana to meet those affected by the fire, to comfort them through prayer and encourage discussion about the way forward. The team appreciated how the programme is changing lives and improving the living conditions of beneficiaries.